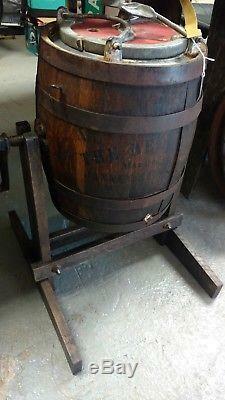 Very cool antique late 19th century hand-cranked oak barrel butter churn on stand. The Belle Churn is manufactured by J. McDermaid of Rockford, Illinois with black stenciling to the sides and a cast iron counter weight. The oak barrel was tumbled end over end until butter formed, but there are no paddles inside the barrel since the cream would churn as it fell inside the barrel. The barrel was rotated between 40-80 revolutions per minute depending on size. The item "Antique 19th century Oak Bella butter churn" is in sale since Wednesday, October 17, 2018. This item is in the category "Collectibles\Kitchen & Home\Kitchenware\Butter Churns". The seller is "echobravosierra" and is located in Lake Oswego, Oregon.